With the economy exploding with more businesses and people needing special services, perhaps you’ve decided to open your own operation as a landscaper, construction builder, plumber, or maybe even work at the horse stables in Saratoga Springs. But in order to do this, you might be asking yourself, “Where can I find the biggest inventory of used trucks near me?” Here in the Capital Region, the answer for you is DePaula Chevrolet. Our Albany showroom offers a huge selection of certified pre-owned and pre-owned trucks, including a full line of popular Silverados that have a reputation as the longest lasting truck on the road. The savings you reap from these pre-owned vehicles can be re-invested back into your new business. You’ll be pleased to also receive a Carfax vehicle history for all of these pre-owned trucks. But you might be asking yourself, “What is the difference between certified pre-owned and pre-owned vehicles?” A certified pre-owned (CPO) vehicle is a used vehicle that has gone through an intensive manufacturer’s testing and is usually backed by a limited warranty with that particular manufacturer’s stamp of approval. A non-certified vehicle is a used car that has not been inspected and has no warranties. However, it can save the buyer thousands of dollars. If you’re looking for a top contender in the full-size pickup segment, the pre-owned 2015 Ram 1500 might be perfect for you and your business. This exceptionally capable and versatile truck offers a bundle of winning features, such as a strong powertrain, smooth supple ride, and well-trimmed cabin. Its available 8.4-inch touchscreen interface is very easy to use. As you travel from place to place in your truck, you’ll be pleased with its refined and quiet cabin, giving you the peace of mind to think about your next stop or make a business call. The Ram 1500 has a nice interior built with quality materials. You’ll appreciate its class-exclusive coil-spring rear suspension providing you with a smooth ride both on highways or in cities. Its interior cabin has almost no noise levels and feels like a luxury-grade experience on the highway. The pre-owned 2015 Ram 1500 offers excellent eight-speed automatic transmission and is the only light-duty full-size truck to feature an optional fuel-efficient diesel V6 engine. Its EcoDiesel V6 provides it with the best EPA-estimated fuel economy in its class. If diesel isn’t your preference, you can choose the traditional 5.7-liter V8 engine or the base gasoline V6. 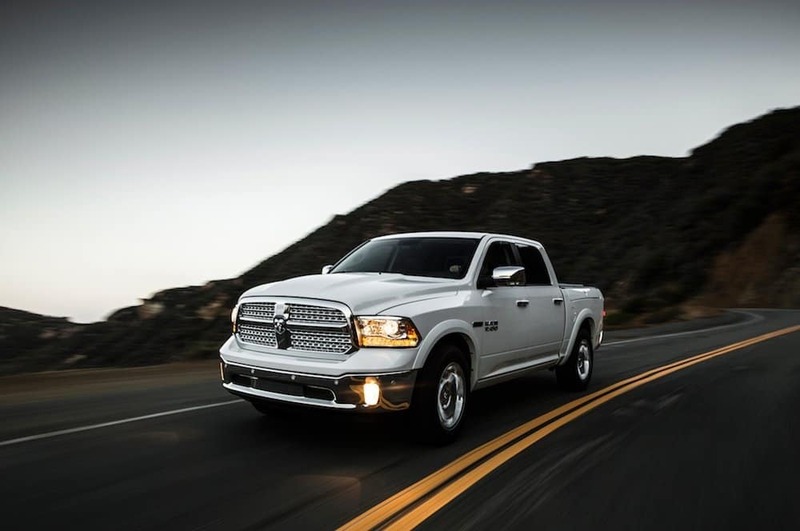 The 2015 Ram 1500 is a satisfying solution as a basic work truck. If you’re looking for a rugged workhorse to help with your farming, construction, or other small business, the certified pre-owned 2015 GMC Sierra 1500 on our lot is the right vehicle for you. It is a solid choice in the full-size pickup truck class. No matter where your business takes you throughout Albany and its environs, you’ll appreciate your Sierra’s comfortable, quiet cabin and its powerful and fuel-efficient engine. In addition to this base model, we often carry additional trims with a wide range of power choices. You can choose between a fuel-saving V6 engine featuring 285 horsepower and a maximum towing capacity of 7,200 pounds up to a powerful 6.2-liter V8 for your business’s heavier towing and hauling requirements. Your 2015 GMC Sierra 1500 will be equipped with an OnStar system (with 4G LTE WiFi capability) and power-folding trailer-towing mirrors. Our other pre-owned Sierra 1500 models feature the latest in safety and convenience technology. They include forward collision- and lane-departure warning systems as well as an 8-inch infotainment touchscreen, smartphone integration, ventilated front seats and a rear-seat video entertainment system. Take a close look at the pre-owned 2016 Chevy Silverado 1500 LT 4WD on our lot. It is one of Chevy’s most important and popular pickup trucks. Chevy sells hundreds of thousands of them each year. No wonder that owners find it to be a very capable and enjoyable light-duty full-size pickup. With the start-up of your business, you’ll be able to turn this new truck into your mobile office. The seats and ride are comfortable with road and wind noise kept to a minimum. It is a perfect vehicle as a simple business workhorse. In comparison to earlier models, the 2016 Chevrolet Silverado 1500 offers you revised front-end styling, several new grille designs, and LED lighting. Inside, you’ll find lots of tech features and USB ports along with 4G LTE connectivity. We also carry additional trim models of pre-owned Silverado 1500 trucks. Depending on the model, you’ll find a 7-inch touchscreen with smartphone integration via Apple CarPlay and Android Auto. When a compatible phone is connected, the touchscreen imitates the phone’s interface so users can easily access popular applications and controls without using their phone directly. On the upper trim levels, the 8-inch screen features CarPlay functionality, while Android Auto comes later in the model year by way of a software update. Under the hood, you’ll find a 285 horsepower, 4.3-liter V-6 engine and a standard six-speed automatic transmission. To help you with your business, this model is equipped with a remote locking tailgate and power articulating assist steps. Please check our website for additional trim models for the Chevrolet Silverado 1500. There you’ll find additional model years from 2009, 2011, 2013, and 2014 in a variety of shades with equipment features, such as the Enhanced Driver Alert package with a lane departure intervention system or an eight-speed automatic transmission with the 5.3-liter V8 engine. So the next time you ask the question, “Where can I find a used truck near me?” look no further than DePaula Chevrolet. Our entire team is eager to work with you to provide the best-used truck for your business. We are truly dedicated to providing quality customer service in all areas of our dealership.